Ramen noodles have long been a cheap and filling dish in the western world. However, now ramen is a separate cuisine. While you can still enjoy plain ramen made just with water and the flavor packet, this college student staple has expanded to a gourmet line of one dish meals. What Can You Put In Ramen Noodles? The difference between stove top ramen and microwave ramen noodles is primarily related to the amount of water you use. For the stove top, you need two cups. You can use less in the microwave. Place a lid over the microwave safe container loosely and heat the water and the noodles for up to two minutes. Stir the noodles with a fork to break them up and test the long loops of pasta for tenderness. If the noodles are a bit stiff, microwave them for thirty more seconds. If the noodles are soft enough, drain off excess water and stir in the flavor packet. Be sure to use pot holders and taste test with care! Starches hold their heat extremely well, so your ramen container may still be extremely hot when you try to remove it from the microwave. SEE ALSO: Can You Microwave Styrofoam​? The instructions for how to cook ramen noodles on the stove are fairly straightforward. 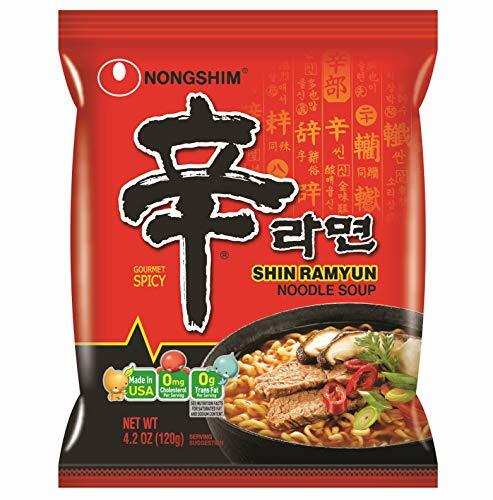 You need two cups of water, a cooking pot and a ramen packet such as NongShim Shin Ramyun Noodle Soup. Get the water boiling and add the ramen in a brick. This will keep your ramen noodles in a long spiral. Per experts with AllRamenRecipes.com, you can use a fork to push the brick of noodles down into the water, and separate the noodles gently as they begin to soften. Add your flavor packet to the noodles after three minutes of boiling the noodles, stirring thoroughly to dissolve the powder. You can then remove the pot from the heat and eat our ramen plain. You can also add cooked vegetables or leftover cooked meat for a filling and nutritious one pot meal. There are many great additions to ramen noodles. You can add fresh parsley or grated carrot for a bit of sweet crunch. Citrus such as a squeeze of lemon or lime can cut through the salty taste of the flavor packet and add some complexity. When working out how long to microwave ramen and what additions you can include, it’s a good idea to only add cooked foods. This may be a great way to use up a leftover chicken breast or bits of leftover steak. If you’re using the ramen flavor packet, consider adding some fresh greens or shredded cabbage to add a layer of freshness. Authorities with the Huffington Post offer several suggestions for ramen dishes that use this easy to prepare and cost-effective staple as the backbone for delicious and unique meals. For example, if you’re working with raw vegetables, consider making a stir fry and preparing your ramen noodles in your best wok. For a really speedy dish, break up the noodles before you put them into the wok. However you work the initial preparation of your noodles, you can add the flavor packet to the noodles once they soften, and stir everything together right before serving. Working out how to make ramen in the microwave may take some experimentation. You may find that your personal microwave instructions for ramen include resting time to make sure the flavor packet dissolves. Be sure to add cooked meat and vegetable additions to reduce the risk of food poisoning.